A Virus It’s Good to Catch? 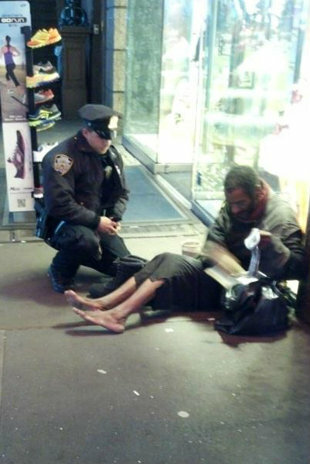 It was about a New York City police officer who had seen a homeless man with bare feet shivering in the cold of the city. He got his shoe size, went off and bought him some boots. The police department posted this picture on FaceBook and a millions of people have viewed it (including you as I have reproduced it here). Someone took the snap and a few cynics said it was staged but the officer is adamant that he did it with no expectations and that it wasn’t a set up. It has had an amazing impact and lifted the spirits of so many people who have heard the story. Research in the Journal of Experimental Social Psychology showed that subjects who witnesed an act of compassion – like someone being kind and caring to an upset person – were more likely to be compassionate towards others immediately afterwards. Whether you celebrate Christmas or not it’s easy to get caught up with the hurly burly, frustration, impatience and feeling that Mammon is holding sway. So when you start to feel a bit stressed, try a little kindness. It helps!